Well pump covers and water well covers are a great way to disguise wells using fake rocks. Here you’ll find a selection of fake rock water wellhead and well pump covers ideally suited for a variety of residential and commercial applications. Well fixtures are notorious for defacing yards and gardens throughout the U.S. Somehow they always end up right smack in the middle of the front yard landscaping, or in the precise spot where you want to plant a flower bed or make a garden path. It’s a crying shame. Time to take a stand and hide that water well cap once and for all! Each of these decorative well covers is fast and easy to install with the included ground stakes. Made in the USA by DekoRRa, the textures and colors are simply outstanding! 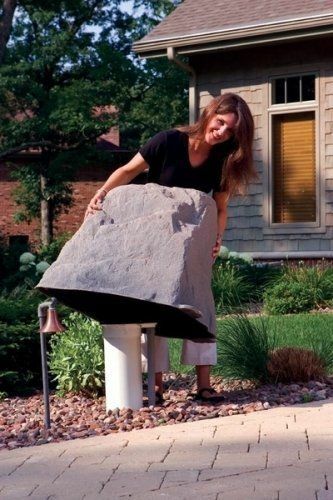 These really do look like real landscaping boulders and they work perfectly for anyone needing well pump covers for pump protection, insulation, and other applications. Please know that it is crucial to first measure the height and the width of the wellhead prior to selecting one of these fake rock well pump covers and water well covers. With measurements in hand, you’ll want to consult the interior dimensions chart to check and see which models will work for your application. Please do not use the exterior dimensions as an indication of coverage ability. The outside dimensions are much different than the available space inside each of these faux rock well pump covers. Is well pump cover insulation necessary? If the well pump motor is below ground and submerged in water than no insulation is usually necessary. However, large outdoor well pumps may require insulation to protect from frost damage and freeze.